With less than two months left in the legislative session, some lawmakers are lowering expectations on what can get done related to funding for roads. The Texas Department of Transportation has been warning lawmakers for months that it needs $4 billion a year in extra revenue just to keep the current level of traffic around the state from getting worse. With less than two months left in the legislative session, some key lawmakers are signaling that they may find more money for TxDOT but will probably fall short of that $4-billion-a-year goal. Several people working on the issue cited a lack of a sense of urgency, particularly in the House. “I think what you’ll see is incremental progress,” state Sen. Tommy Williams, R-The Woodlands, the Senate’s chief budget writer, said in a recent interview. The funding ideas that lawmakers appear most inclined to approve include restoring $400 million of the money Texans pay in gas taxes that are currently diverted to the Department of Public Safety and putting perhaps $1.7 billion from the Rainy Day Fund toward a revolving infrastructure fund to finance certain transportation projects. Some are attributing the lagging momentum in transportation funding to the so-called orange cone problem. With dozens of major road projects under way across the state, transportation funding doesn’t seem as pressing a problem. Transportation advocates insist that impression is misleading. 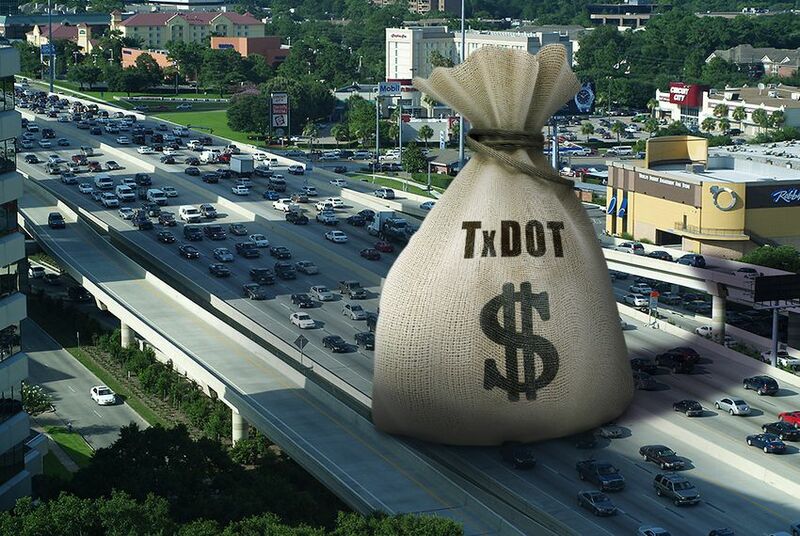 As the gas tax has not kept up with the costs of the state's transportation needs, TxDOT has funded the last decade of highway projects in large part through toll projects and issuing billions of dollars in debt. The agency now faces a “fiscal cliff” of sorts as it expects most of that debt-financed revenue to run out after 2015. At that point, the agency expects to dramatically scale back road projects while the state’s population will keep growing, leading to worsening congestion on roads. Phillips said that some of the more than 40 new members of the Texas House probably haven’t grasped the complexities of the state budget yet, making tough votes even tougher this session. “I don’t think we’re quite there yet, and quite honestly I think it takes a session or so to quite understand that,” Phillips said. Several proposals to boost money for transportation projects have been put forth this session. They include an increase in the vehicle registration fee, dedicating the sales tax already collected from car sales to road projects and dedicating the sales tax already collected from tires and auto parts. In the Senate, Nichols and Williams, the previous chairman of the Transportation Committee, are viewed as leaders on the issue, yet they disagree on the best approach. Nichols has filed a bill gradually dedicating a portion of future vehicle sales tax revenue to the highway fund. He touts the plan as providing a reliable source of revenue for TxDOT while also being able to draw support from majorities in both the House and Senate. Phillips is sponsoring the measure in the House. But Williams said the plan doesn’t provide new revenue fast enough and will become problematic for future legislatures as, over time, a bigger portion of state tax revenue gets automatically dedicated to roads. “It’s easy and appealing unless you’re writing the budget,” Williams said. He said an increase in the registration fee makes more sense but acknowledged that the House remains a likely roadblock politically. “I can pass a fee bill, but you’ve got to get me something out of the House I can work with,” Williams said. As House and Senate members meet in conference to reconcile differences between the two chambers’ budget plans, Williams said he was optimistic he could secure for TxDOT $400 million of the $600 million in gas tax revenue that is typically diverted from the state's highway fund each year to support the Department of Public Safety. That diversion has long been a source of frustration among conservative activists who feel that all of the gas tax should go toward road construction and maintenance. Lawmakers are also still talking about a proposal championed by Gov. Rick Perry to tap the Rainy Day Fund to fund an infrastructure bank that would help finance road projects, some of which are expected to be toll projects in order to raise revenue to pay back the loans. Perry is slated to deliver the keynote speech at a transportation conference in Austin on Friday that could give a sense of what he hopes lawmakers will accomplish as the session winds down. Meanwhile, Nichols and other transportation advocates are still sounding the alarm, arguing that the Legislature cannot afford to delay finding a funding fix. Waiting will mean transportation projects taking longer to get done and probably costing more, he said. Late Tuesday, a broad coalition of business groups including the Texas Association of Business, the Texas Oil and Gas Association, the Texas Motor Transportation Association and the Texas Association of Realtors endorsed a multi-pronged plan that would raise $3.6 billion of the $4 billion per year in additional revenue requested by TxDOT. The plan includes using money from the Rainy Day Fund, ending some diversions from the gas tax, raising vehicle registration fees statewide by $50 and dedicating a portion of sales tax revenue already collected from vehicle sales to highway projects. "It is critically important for the business community that the Legislature move forward on raising the necessary revenue to protect and sustain the Texas highway system for our citizens and businesses," the group said in a statement. "The program must be planned and reliably funded well into the future."